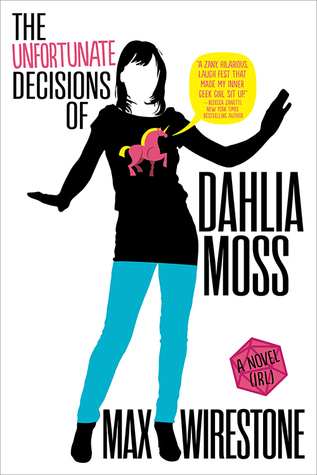 Dahlia Moss is a hot mess. And nothing great on the horizon. So when she's offered a chance to play detective and recover a spear from an online MMORPG called Zoth for a huge wad of money she shrugs her shoulders and thinks 'why not'.ure, whatever, she's not a detective and the guy is a little nuts but it's not like she has anything better to do, other than mooch around her friend Charice's apartment and eat ramen until her next disastrous job interview. It's all fun and games - literally in this case - until her 'client' shows up dead. The stakes are higher for Dahlia and time is running out. If there's one thing I love more than a geeky novel, it's a geeky novel with a sarcastic and cynical protagonist. Sitting on the right side of 'quirky' and opinionated, without the lack of self confidence and self awareness attributed to the manic pixie dream girl trope. Dahlia is no damsel in distress nor is she a warrior woman, she's confident, intelligent but other than that she's pretty normal. Her YOLO - slightly Millennial - attitude is what drives the book where she literally has nothing better to do than investigate a Cyber crime/murder in an MMORPG. Despite this, she's a realist. There's plenty of moments where you can almost feel her side-eyeing a hidden camera with an 'are you actually kidding me' look. And Dahlia isn’t the only person in the story who feels fresh, there’s also a colourful mix of characters - my favourite is Dahlia's ridiculous roommate Charise, who has a thing for over the top hijinks most of which Dahlia turns a blind eye to because she’s so used to it. The great thing about many of the nerdier side characters is that they don’t just fall into the ‘geek’ character trope. They all feel like fleshed out people - weird as it sounds I’ve definitely come into contact with personality like some of the Zoth gamers she meets during the story. Plot-wise it's refreshingly fun, and the right amount of geeky and full of pop culture references without being condescending or inaccessible to a non-nerd audience. Yes, there are parts of the story where Dahlia is knee deep into playing Zoth, but that comes secondary to solving the murder mystery and delving a little more into her character development. And for those craving that satisfying ‘detective story end’, this one comes with an amusing twist on the usual cop/criminal showdown.